Place steak in nonmetal dish or large resealable food storage plastic bag. Pour wine and salad dressing over steak; turn to coat. Cover dish or seal bag. Refrigerate at least 4 hours or overnight to marinate. In medium bowl, combine all sauce ingredients; mix well. Cover; refrigerate until serving time. Heat grill. When ready to grill, remove steak from marinade; discard marinade. Place steak on gas grill over medium heat or on charcoal grill 4 to 6 inches from medium coals. Cook 12 to 15 minutes or until of desired doneness, turning once. Spread both sides of bread slices with 2 tablespoons of the butter. To toast, place on grill during last 2 to 4 minutes of cooking time. Turn once. Melt remaining tablespoon butter in small saucepan over medium heat. Add mushrooms; cook 2 to 3 minutes or until lightly browned, stirring frequently. To serve, spread 1/4 of the sauce on one side of each toasted bread slice; place on serving plates. Cut beef into thin slices diagonally across grain; place over sauce. Top each serving with mushrooms. Sprinkle with parsley. To broil steak, place on broiler pan; broil 4 to 6 inches from heat using times above as a guide, turning steaks once and adding buttered bread slices to pan during last 2 to 4 minutes of broiling time. Turn bread once. Flank steak is a long, thin piece of boneless meat cut from the lower hindquarters. Flank steak is known to be one of the tougher cuts of meat, and it is usually marinated before it is grilled. Naturally quick-cooking, flank steak is typically used for fajitas and London broil. Marinate the steak and prepare the sauce the night before. Cover and refrigerate them separately. Just before dinner, grill the steak and assemble the sandwiches. 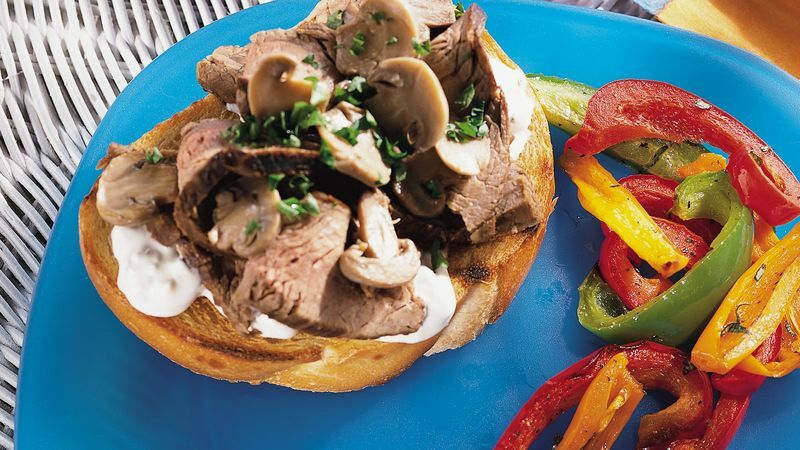 Serve this hearty open-faced sandwich with a knife and fork so your dinners can savor every last mushroom and bit of sauce. Enjoy this meaty sandwich with grilled pepper strips and a glass of beer.